As a reminder, VIX futures settle on Wednesdays at 9:20 a.m. New York time in an auction by Cboe Global Markets. As Bloomberg notes, VIX was heading for its longest streak of daily losses in almost a year in early New York trading, before it reversed direction and rose as much as 11 percent. 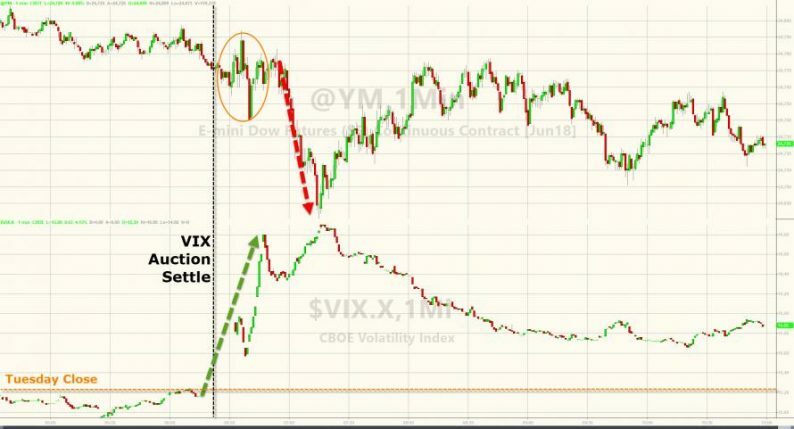 The gain occurred around the time of the settlement, which happened 13 percent above the VIX close on Tuesday and outside of today’s range. 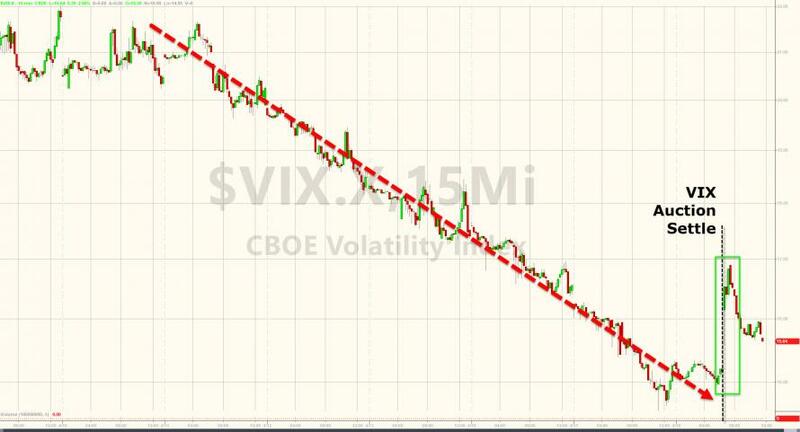 Just two months ago, regulators finally opened a probe, on monthly expirations, settlement occurred outside the VIX’s same-day trading range 42 percent of the time last year, the most since 2005. The average occurrence was 15 percent in the decade through 2016. While a lot of innocent explanations exist, “really, it is a mystery,” said Pravit Chintawongvanich,the head of derivatives strategy for Macro Risk Advisors. It actually seems like VIX manipulation is an inside-joke, as Hennessy of IPS says in a market dominated by professionals, everyone plays at his own risk. “Like any market it is susceptible to manipulation by large participants but I think that most VIX traders understand that,” he said. If Everything’s So Awesome, Why Are Investors Surging Into Tech-Stock Hedges?